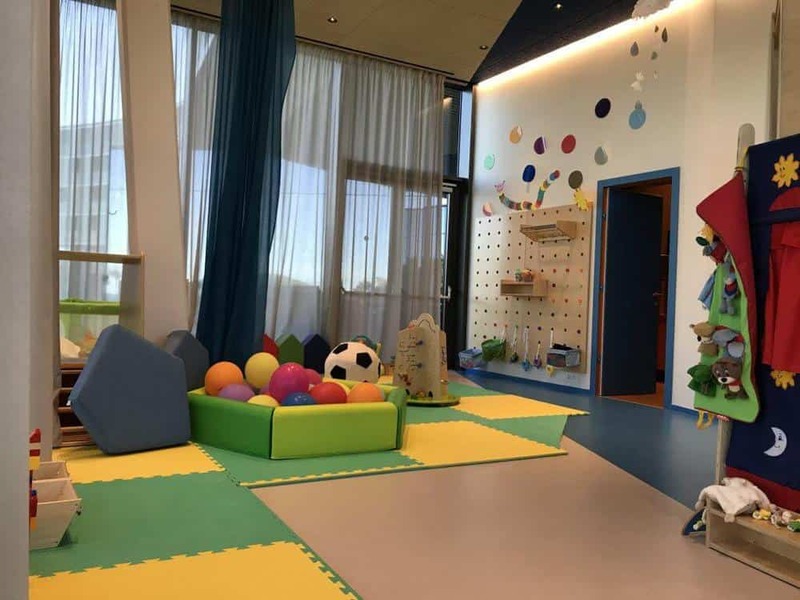 When we moved to Europe, we discovered the amazing kinderhotels throughout Europe. Imagine a hotel that caters to children. Playgrounds, heated pools, kids clubs, child safe hotel rooms, buffet meals with kids bars, activities and a spa for the parents. 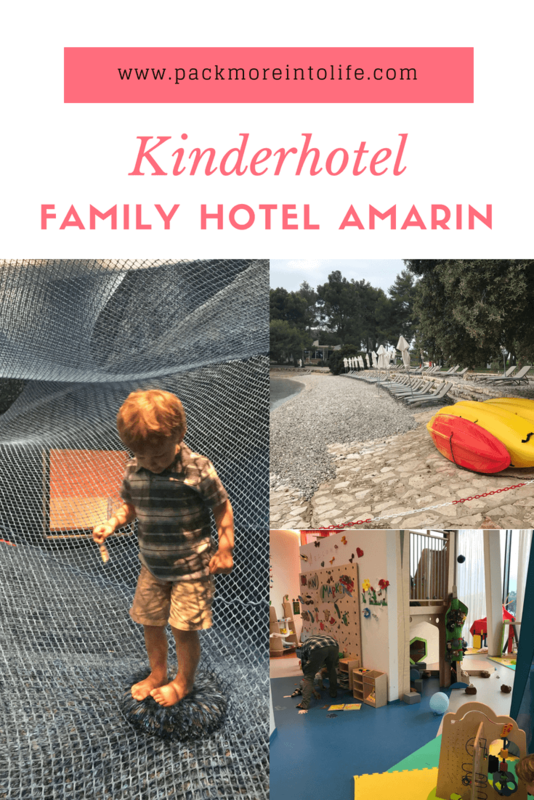 We stayed at Kinderhotel Family Hotel Amarin in October of 2017 as a part of our 10 day trip to Croatia. It was a perfect end to our trip. 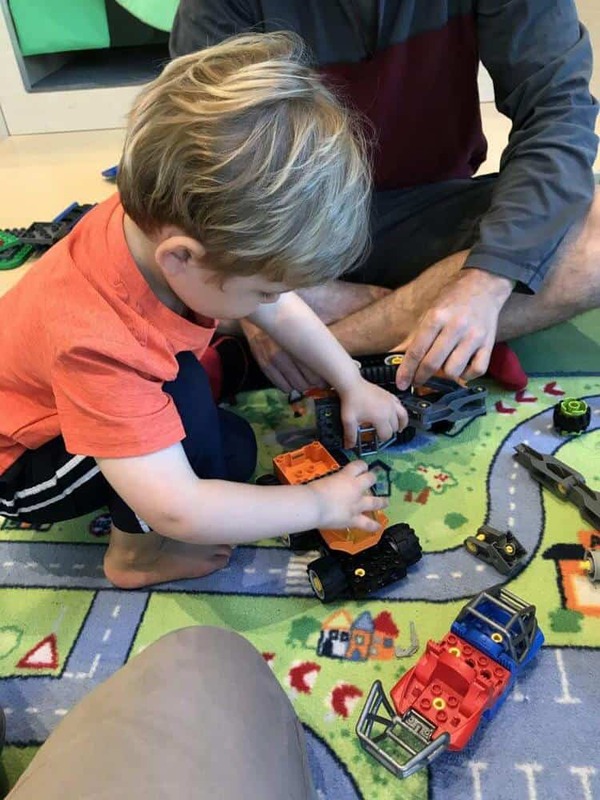 We were able to relax, spend time with our then almost 3-year-old son and relax for a few days. Enjoy my in-depth review. 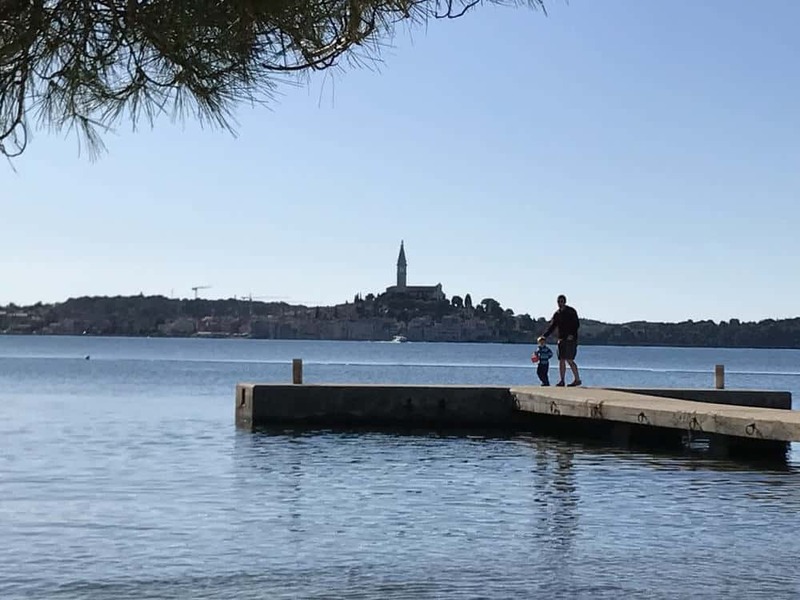 When you’re done, head back to my main post “Enjoying Croatia Family Holidays”. 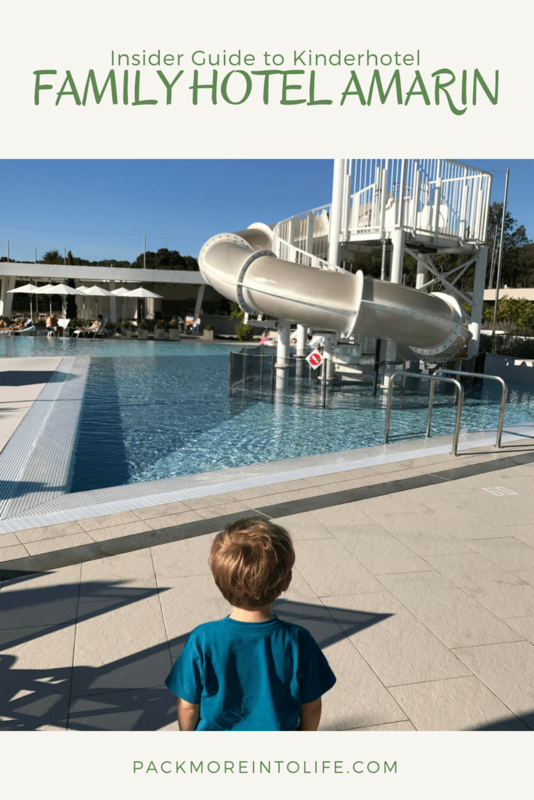 Kinderhotel Family Hotel Amarin is located just outside Rovinj, Croatia (Northern Croatia). 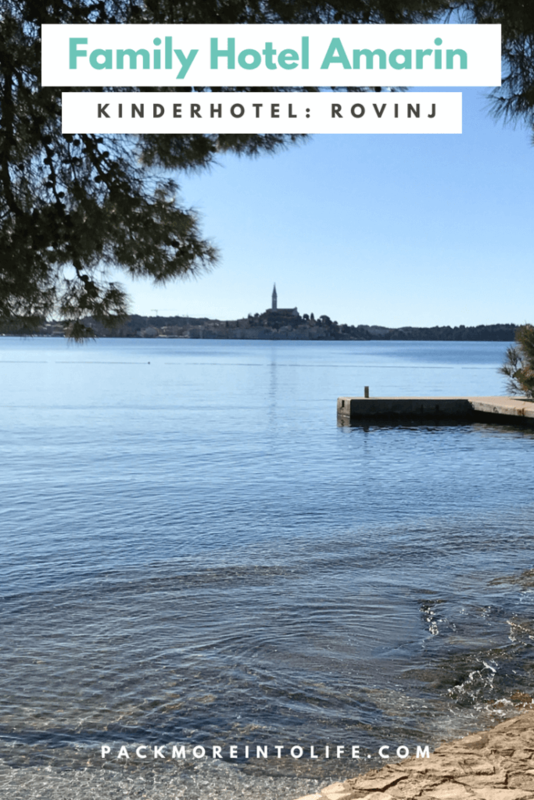 In 2015, National Geographic released “Destinations of a Lifetime” and listed Rovinj (as the only Croatian destination) on the list of one of the 225 world’s most amazing places. The hotel opened at the end of 2016 and has been welcoming families with its kid-friendly activities and clubs. 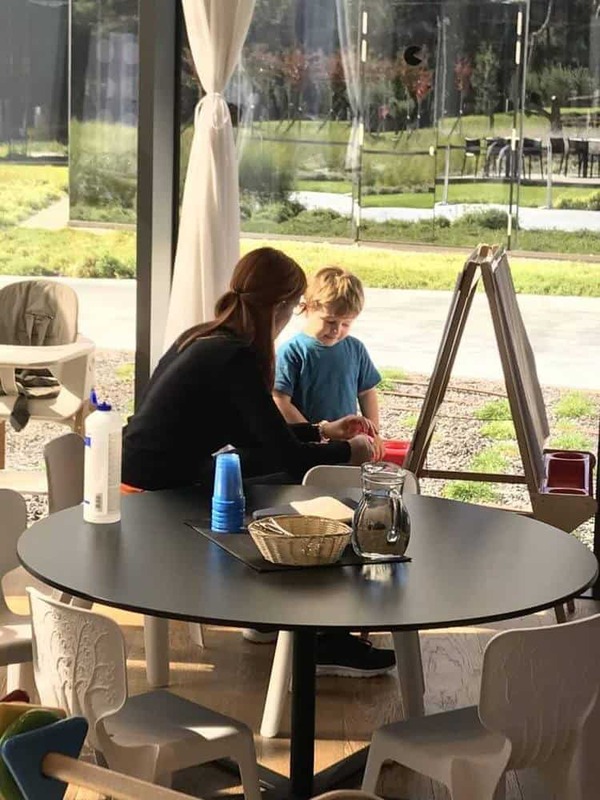 A kinderhotel is a hotel that caters to families. 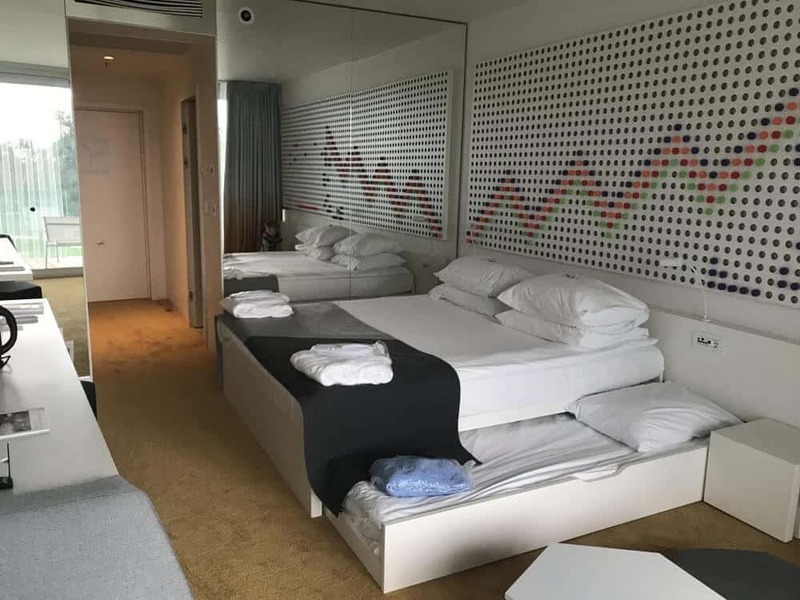 The facilities are child safe, meaning special bands for opening doors, child-proofed hotel rooms and rooms with child-sized slipper and robes. Meals feature plenty of high chairs and booster seats, as well as a kids food bar at their height to serve themselves. Some even feature fresh fruits and vegetables to make baby food. Entertainment is geared towards the kids with movies, dance parties, and balloon makers. Best of all, a stay includes free all day childcare in the kid’s clubs. Check your children into the clubs and while they have a blast you can enjoy a trip to the spa or a drink at the bar. 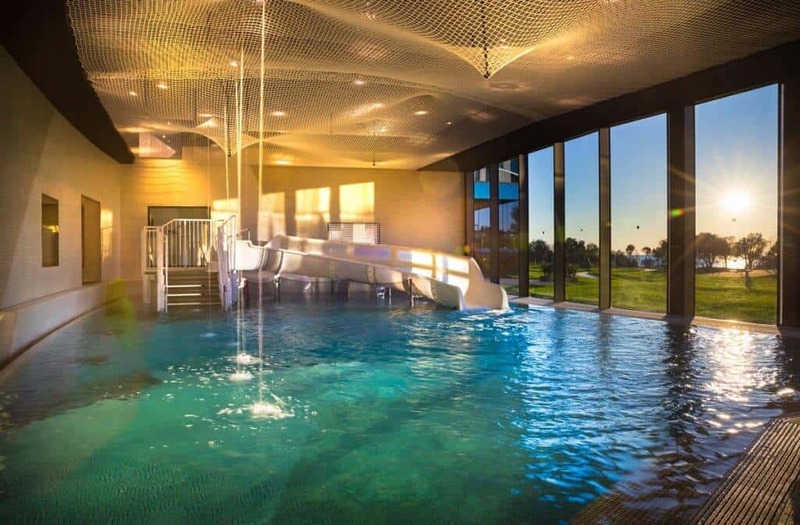 Indoor heated pools with slides, outdoor pools with wading zones, splash pads and toys. Playgrounds all around and staff to help in any way possible. Seriously, you can’t beat a kinderhotel with kids. If you arrive by car, pull into the FREE parking. Then head into the lobby for check-in. Your children will quickly spy the massive net climbing zone and will beg to go explore. Let them, it’s closed off and super safe. Now you can enjoy checking-in without any distractions. Our stay was pre-paid, so after a few quick signatures, talking about the food service hours and getting some general information we were almost ready to go within 10-15 minutes. 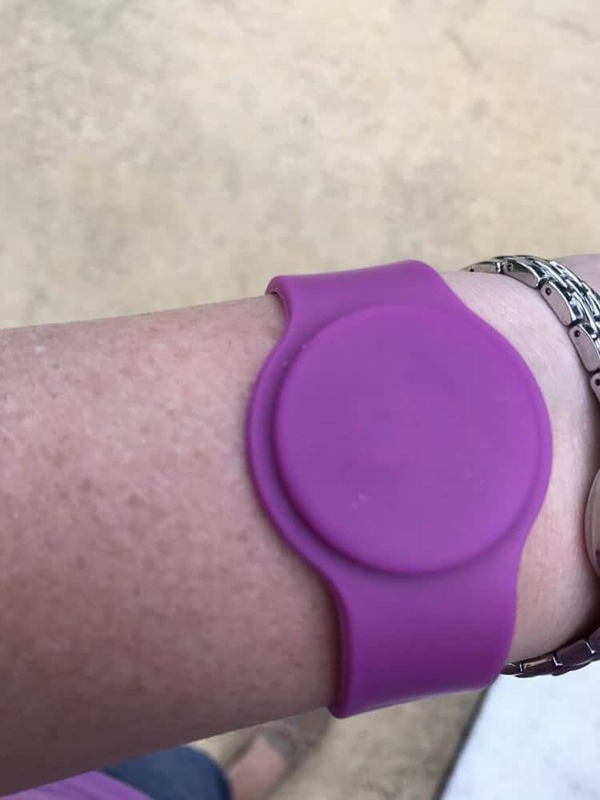 Each adult receives a smart bracelet. It is your hotel room key, your check-in for all meals and access to the resort amenities. You’ll also need these smart bracelets to turn the lights on in your room and enter/exit the kid’s clubs. Our son didn’t receive one, which was good because he couldn’t open the gates to escape the resort! Smart bracelets that act as your hotel key, access to the facilities and gate openers. Each standard room can sleep up to 4 (2 adults and 2 children). You request how many additional beds you need when you book the room. The beds are on a sliding wall track and the kid’s beds are tucked under the adult beds, making them lower to the ground. The room is completely baby proofed and has ample space for a family. You can also request a cot or pack and play for little ones. Standard room with an extra bed. If you have more than 2 children, you can book a premium family room and it allows up to four children. A nice bonus for larger families. There are also grand rooms and suites. Most of the hotel rooms have a shower, so look when you make the booking if you require a bathtub. 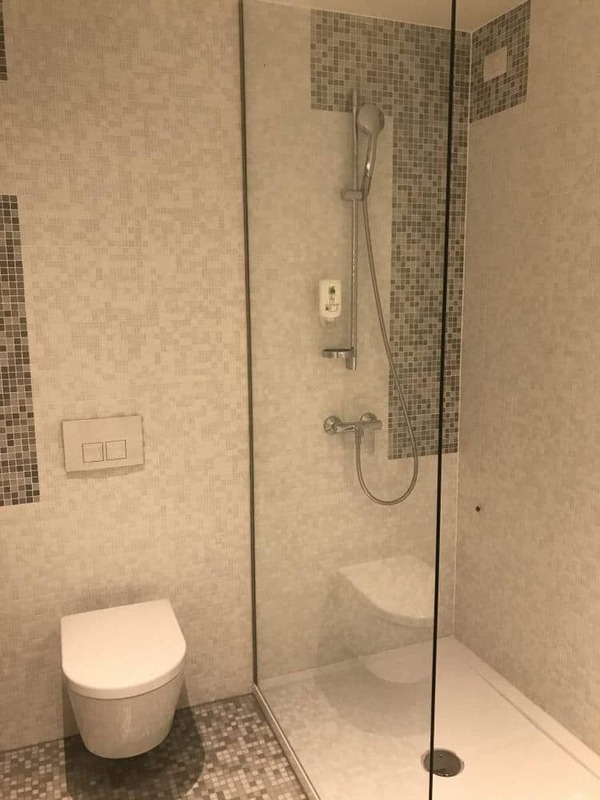 Bathroom in a standard room. The rooms have a mini-fridge (stocked mini bar, not free), free wifi, a child-friendly balcony, air condition (must have in summer) and sea views. Views from our hotel room. All hotel rooms feature a sea view. 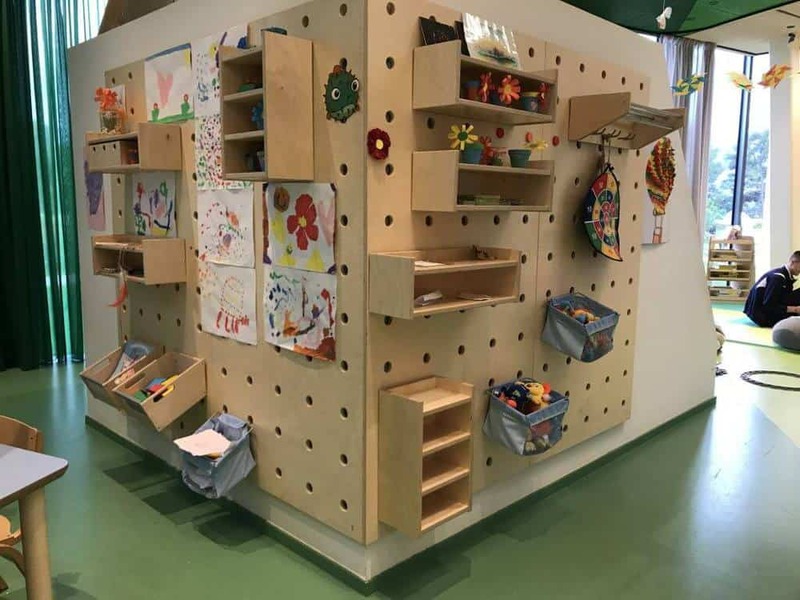 We enjoyed the pegboard style decor where our son could make pictures and designs on the wall. There are extra pegs in the removable bedside table. 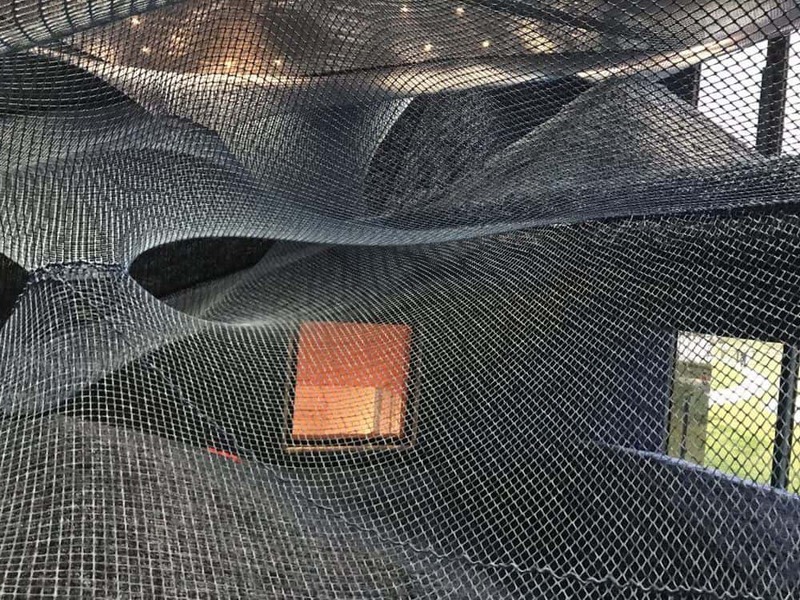 Lobby: As mentioned before, there is a huge net climbing area directly in the lobby. We were frequent visitors playing tag, sliding down the hills, climbing through the nets and exploring. We’ve never seen anything like it! Also, to the right of the climbing net is usually some kids entertainers. We received balloon animals, stamps, and stickers throughout our stay. Bonus: there is a small cafe located right across from the play area. So if you have older kids, you can kick back and enjoy a nice drink or coffee while the kids get some energy out. We were frequent visitors for their smoothies. Lower Level: This is where the magic is! If you walk down the stairs from the lobby, you’ll see the huge dining are on the right. More about that soon. to the left, you’ll walk down a hallway with a kids gym. You’ll see an entrance to the heated indoor pool and spa area. At the end of the hall, you’ll find doors outside and straight ahead to the kid’s clubs. Kids Clubs: Kinderhotel Family Hotel Amarin features childcare and kids clubs from babies through toddlers. 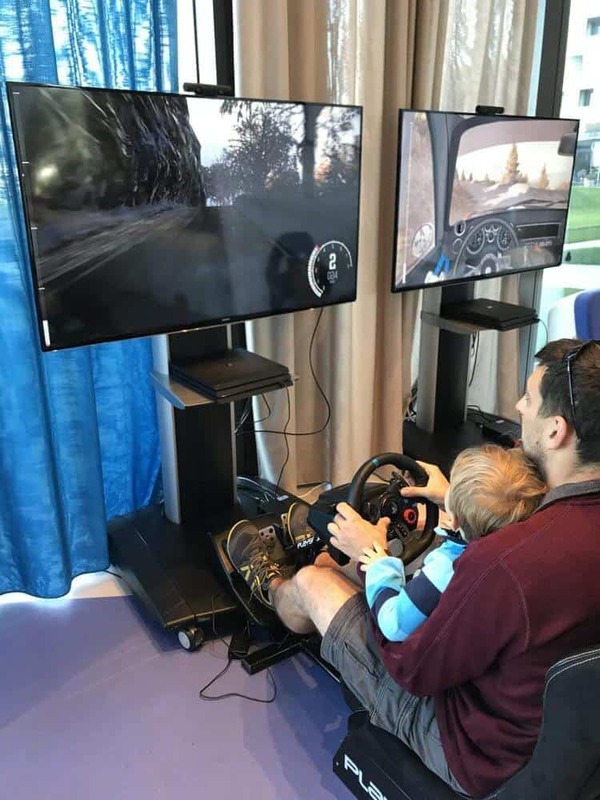 Since our son was almost 3 years old, he bounced between the baby club and the mini club. When you walk towards the kids club area, the staff will open the glass doors for you (a great safety feature). Then you’ll arrive at the check-in desk. You’ll fill out a card with your child’s information and the parent’s information with contact phone numbers. At the time of our visit, they would clip this paper on the board in the room under a category (with a parent, kids club (alone)). 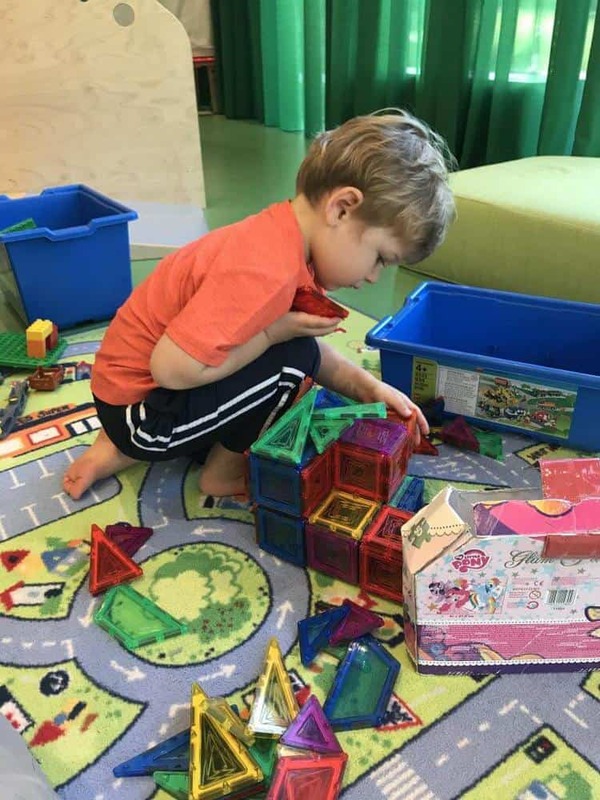 Our son was still very mommy centered, so we did not leave him in the kid’s clubs during our stay, but that means I can tell you….the staff was fabulous! The staff interacted with the children settled kid-to-kid disagreements with grace and made sure everyone was having fun. A few little ones weren’t so fond of their new surroundings and they snuggled the little ones, sang to them and distracted them with fun things to do. The staff is also multilingual. We heard a variety of languages and their name tag features the languages they spoke. As an English speaking family, we didn’t have any difficulties communicating. There were 3 different rooms, as well as activities rooms and a central area with free drinks and bathrooms. Also, a schedule that featured the fun activities for the day. Free drinks in the kids club, a great perk for the kids. The kids club areas featured large windows, making the rooms bright. The toys were of high quality. Lots of make-believe zones, climbing structures, dress up and building areas. We sat for hours with the educational duplo kit that we later purchased after our trip. There were tables for completing arts and crafts activities as well. Everything was clean and organized with the staff picking up and cleaning toys as the day progressed. Fun Duplo kit in the mini kids club. All of the toys were high end. Each room connected to a fenced outdoor space for nice weather days. The play equipment was also of high quality and clean. Just outside the entrance to the kids club, you can borrow/sign out a variety of bicycles and tricycles. With fabulous paved paths just outside, it was a wonderful idea for exploring the resort property. For teens, there is a massive games room with multiple gaming devices and ping pong tables outside. Indoor Pool: Just as you enter the lower level, you’ll see the entrance to the indoor heated pool. Grab a towel from the staff and head into the changing rooms. Or wear your robe over your swimsuit like many families. Shower off and you ready to go. We brought some fun pool toys with us. The pool on the left features a fun kid-friendly slide, but you’ll need a lifejacket or water wings, it is deep at the end. On the right-hand side is a long rectangular pool for general swimming. Just up the steps are 3-4 hot tubs that kids are welcome to go in. Then at the very top of the walkway is the saunas. We really enjoyed the indoor pool since our visit was in October and the outdoor pool was too cold. Outdoor Pool: There is a large outdoor pool with slide (ends in ankle deep water). There is also a lazy river type pool right next door with floats. We really wish the weather had been a bit warmer to enjoy the beautiful outdoor pools. Plenty of lounge chairs as well. 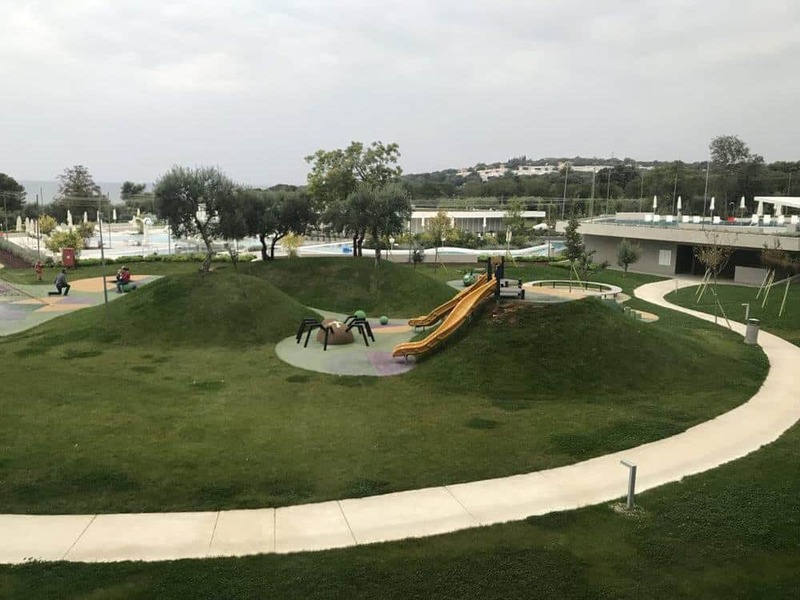 All of the pool areas are located in one area, so away from the playground structures and bike riding areas. This helps to keep kids safe. Outdoor amenities: The outdoor space is really lovely. It is located in another section of the outdoor zones and also fenced off for safety. You can borrow various bikes/tricycles, hit the playgrounds or climbing structures. If you want to venture a bit further, use your watch to open the gates. Beyond the fence, you’ll find the path down to the beach, musical outdoor toys (like chimes and drums), a beachfront restaurant (only open in season), and trails leading up to scenic overlooks. Beach: The beach area is pebbly. There are lounge chairs and piers to explore. You can see the beautiful town of Rovinj, best at night when it is all lit up. You can also rent toys to play in the ocean at the beach hut. 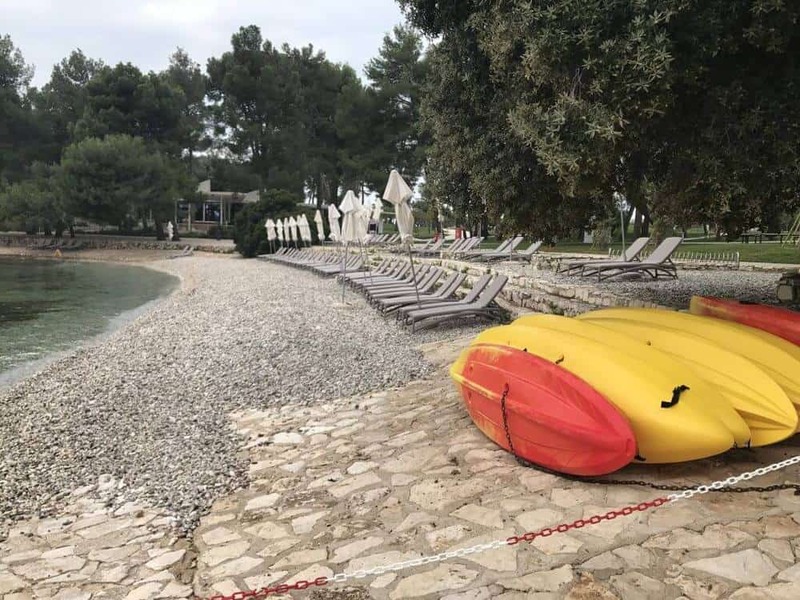 They have paddle boats with slides, kayaks and stand up paddle boards. 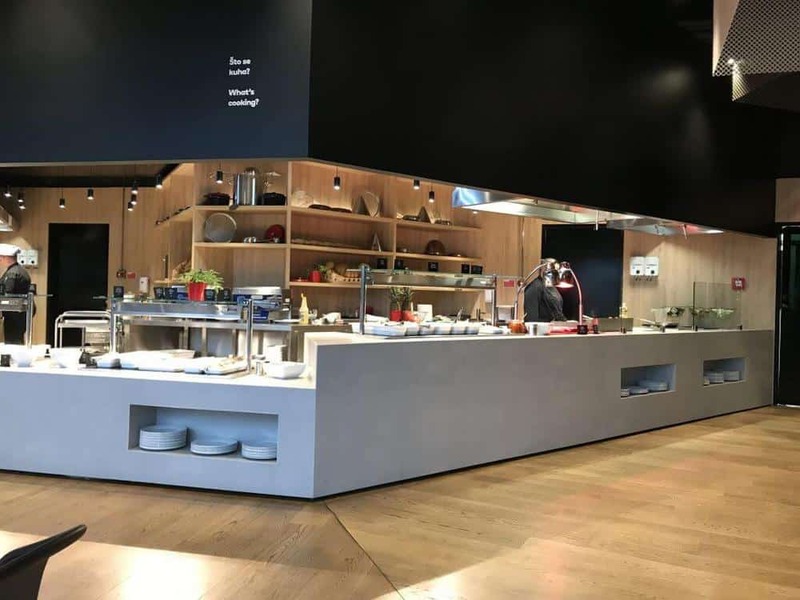 Restaurants/Food: We really enjoyed the food at Kinderhotel Family Hotel Amarin. The dining room is large enough to accommodate for the many families staying at the hotel. There are plenty of highchairs and booster seats scattered throughout the dining room. We typically sat close to the entrance where the staffed children’s area was located. We liked the fact that our son could venture over and play for a bit while we finished eating. You can also sign up to have your children dine with an attendant in this area if you’d like to eat on your own. All meals are buffet style. You’ll see areas with appetizers, salads, warm and cold dishes, a dessert bar and fresh fruit. The warm options change each night and we did not see much of a repeat over the 3 nights we stayed at the property. 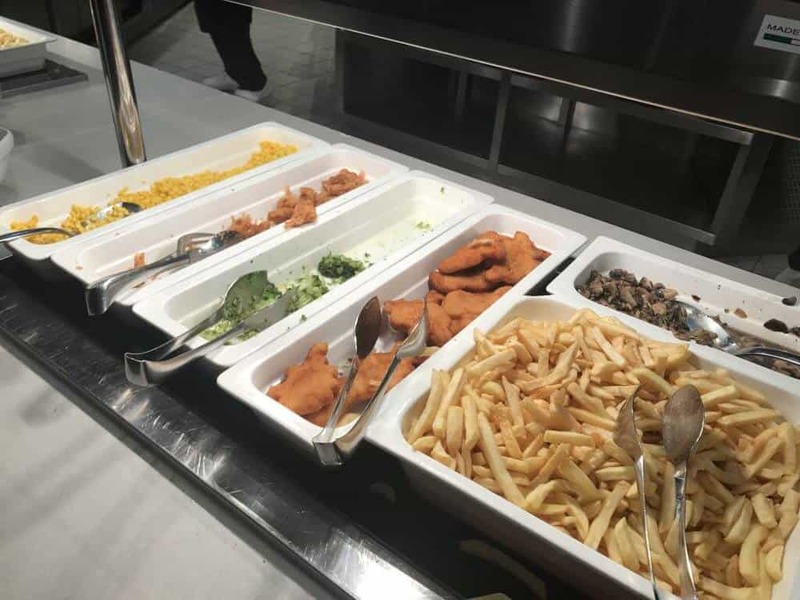 The kid’s dishes included the typical chicken, fries, pizza, but they also included other items such as fish, vegetables, and pasta. The kid’s dishes are at a lower level to help children serve themselves independently. A few gripes: It does get pretty loud with all the children. You can try to tuck yourself into a corner or dinner later in the evening. Most families show up within 30 minutes of the dining time opening and with so man people, the volume gets pretty high. Fussy babies, dropped silverware, you get the idea. You also have to pay for all of your drinks on top of the “full board” package. That means you have to pay for water, juice, milk for the kids and soft drinks. The only time that drinks are provided is breakfast. They have a selection of juices. We learned to bring our reusable containers and fill them up for later in the day. Otherwise, there were plenty of options to keep everyone happy and the service staff was helpful and kind. There is also a huge baby food station. 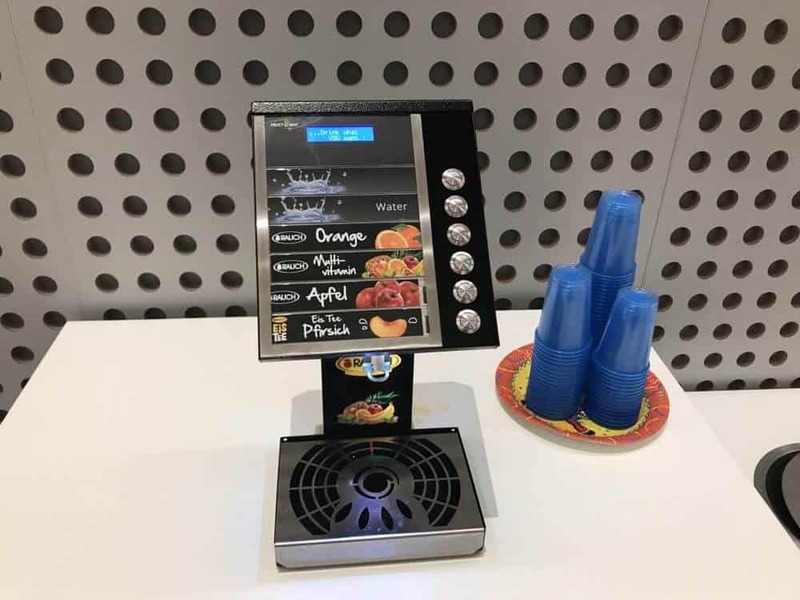 You can select fresh fruits and vegetables and the staff will prepare fresh purees at your request. They had baby cereal, various oats, and pre-made baby food jars. We were only able to dine in the main restaurant because the beachfront restaurant was closed in October. But I’m sure they also have lovely meals there. Spa: We, unfortunately, did not partake in any spa services, so I can’t comment on their quality. However, we did see many moms and dads entering the spa throughout the day, so I can only assume that they were well taken care of. Kinderhotel Family Amarin Hotel does offer free shuttle service to explore the town of Rovinj. We had planned to take part in this activity, but honestly, 3 nights was barely enough time to really enjoy the resort. After doing quite a bit of sightseeing for the past 7 days, we just wanted to kick up our heels and relax for a while. The entire hotel is very stroller friendly, so bring the stroller and enjoy a nice walk around the property. We saw plenty of moms going for a walk to get their little one to sleep and then they pulled the stroller up to the cafe to have a nice break. If you don’t want to spend money on ordering drinks, there are plenty of little shops just off the property where you can purchase a case of water and any other drink you might want. Then just tuck them into the mini fridge. We really enjoyed our stay at kinderhotel family amarin hotel. It had everything we could ever ask for and helped us to unwind with our son. He loved all the kid-friendly features and we enjoyed quality time as a family. 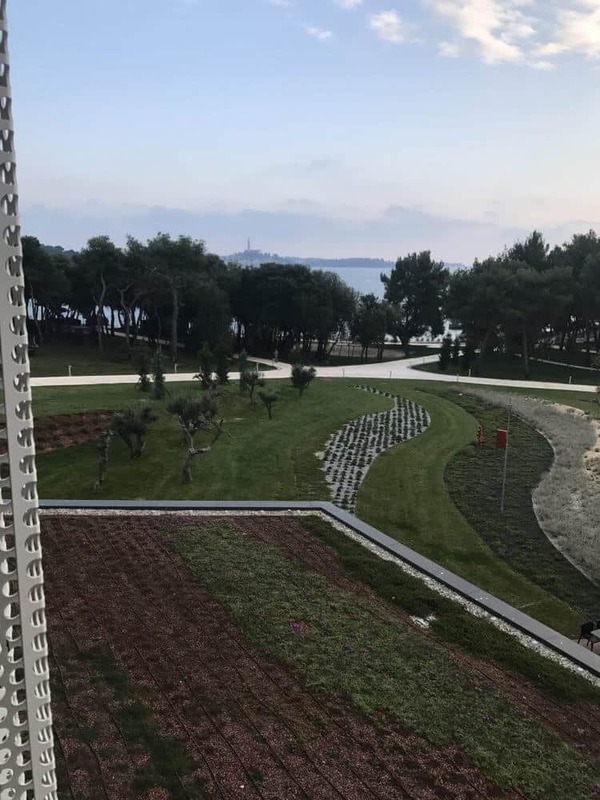 Want to read more about our trip to Croatia, head back to the main post HERE. Or perhaps you’d like to see our other travels around the world? Head to our destinations page with an interactive map!